Paying for graduate school with undergraduate and credit card debt. I recently decided to go back to school for a degree in software engineering. My short terms goal after school is to apply for a job with one of the top software application companies. My long term goal is to eventually start my own business specializing in creating custom apps for businesses and/or individuals. I am in debt from previous undergraduate loans and credit cards also. I am familiar with Fastweb and have started researching on graduate grants and loans for women in technology fields. I've read some of your articles but would like more information when it comes to graduate education. Will my credit history determine if I get a grant for school? Does FAFSA use credit score or debt to determine how much you get for school? What is the best way to get the maximum money for grad school? — Rose D. Financial aid for graduate school differs from financial aid for undergraduate school. Financial aid from the college or university tends to be decentralized, with each graduate department awarding its own financial aid funds. This is in contrast with undergraduate financial aid, which is much more likely to be centralized in a single financial aid office for the entire institution. Graduate students, especially those in science and mathematics, are often funded through research contracts procured by individual faculty members. These graduate students work for the faculty member as a research assistant (RA). The research assistantship usually provides a tuition waiver and a small living expense stipend. More than half also include health insurance. Accordingly, the graduate student's fortunes are more closely tied with those of the faculty member and the graduate department. Graduate students may also be funded by teaching assistantships (TA), where the graduate student performs teaching duties, such as running a recitation or tutorial session for a large undergraduate class, grading assignments and tests, holding office hours and teaching one or more undergraduate classes. Teaching assistantships tend to be less generous than research assistantships. A teaching assistantship is less likely to offer a living stipend or health insurance, and may provide only a partial tuition waiver. In addition to graduate fellowships from the graduate department, some graduate students win private fellowships from foundations and corporations. Fastweb not only lists scholarships for undergraduate school, but also fellowships and other forms of financial aid for graduate school. The tips from Secrets to Winning a Scholarship also apply to graduate fellowships. There are no federal need-based grants for graduate school like the Pell Grant for undergraduate students. Individual federal agencies may offer their own fellowship programs, such as the National Science Foundation's Graduate Research Fellowship and the US Department of Education's Jacob K. Javits Fellowship in the arts, humanities and social sciences. These tend to be focused more on academic merit than financial need. After all, most graduate students demonstrate financial need, since they no longer are considered dependent on their parents for financial support (except perhaps for students in law school or medical school). Graduate students who are working may be supported by their employers through employer tuition assistance programs. Typically the employer will require a minimum of a B average for continued support and the student must agree to work for the employer at least one year after graduation for each year of support. There are also education tax benefits, such as the Lifetime Learning Tax Credit, which can provide some money through the federal income tax return based on amounts paid for tuition and fees. The Lifetime Learning tax credit provides a non-refundable tax credit based on 20% of the first $10,000 in qualified higher education expenses, up to a maximum of $2,000. 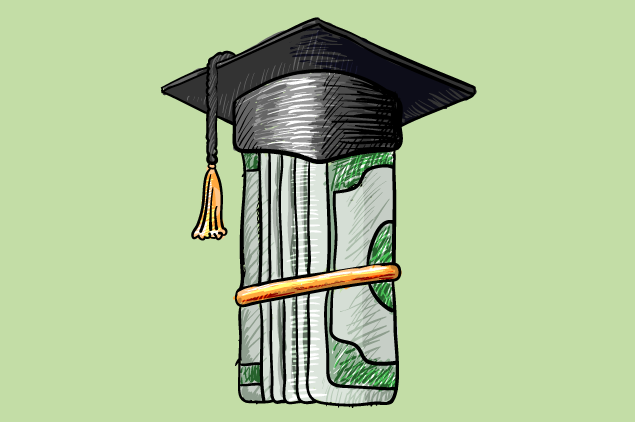 Finally, there are student loans, the most common form of financial aid for graduate school. Graduate students are eligible for up to $20,500 per year in unsubsidized Stafford loans ($40,500 for certain medical school programs). There is an aggregate limit of $138,500 ($224,000 for medical school students), including undergraduate Stafford loans. After a graduate student has exhausted his or her Stafford loan eligibility, the graduate student may borrow from the Grad PLUS loan program. The Grad PLUS loan has an annual limit of up to the full cost of attendance minus other aid received, with no aggregate limit. There are also private student loans, such as bar study loans for law school graduates and residency/relocation loans for medical school graduates. Most federal student aid programs do not depend on the student's credit history, nor the amount of prior debt. For example, the Stafford loan program does not depend on the borrower's credit history in any way. To be eligible for the Grad PLUS loan program, however, the borrower must not have an adverse credit history. An adverse credit history does not depend on credit scores. Instead, the borrower cannot have a current delinquency of 90 or more days on any debt. The borrower also cannot have had a bankruptcy discharge, foreclosure, repossession, tax lien, wage garnishment, default determination, a charged-off account or an account in collection within the last five years. Private student loans depend on the credit scores and credit history of the borrower and cosigner. (More than 90% of private student loans require a cosigner, as most students have thin, non-existence or negative credit histories.) Eligibility for a private student loans and the interest rate are based on the higher of the two credit scores. In addition, most private student loans use secondary criteria that are stricter than the Grad PLUS loan's adverse credit history criterion. Borrowers who do not qualify for a Grad PLUS loan are unlikely to qualify for a private student loans. Graduate students who are married often trade off, with one spouse working while the other goes to graduate school. Based on the 2007-08 National Postsecondary Student Aid Study (NPSAS), about two fifths (41%) of graduate and professional students receive some form of grant aid, including graduate fellowships from the school or private sources, assistantships or employer tuition assistance. Graduate fellowships from the school are received by 12.3% of graduate and professional students, assistantships by 15.2%, employer tuition assistance by 20.9% and private fellowships by 3.7%.